How much power does a coilgun require? How do you choose voltage and amperage capabilities? Generally speaking, a bigger supply is always better. A larger supply with extra capacity will maintain the voltage better than a wimpy supply. And if the voltage droops, the current will slump, causing the magnetization inside the coil to be reduced. Anyway, once you have wound the coils and selected the power transistors, then the power supply requirements are fairly straightforward. Let's work through an example, using my coils and my power output stage. My design has 5-ohm coils driven by 2N2955 power output transistors. How much power does this take? First find the voltage: The 2N2955 (and its complement 2N3055) are rated for Vce up to 60v. However, suppose my filter capacitors are only rated for 30 vdc. Let's choose a conservative supply voltage of 25v. Next the current: Since two coils are turned on together in parallel, the load resistance is half of one coil, or 2.5 ohms. The current at 25v is given by Ohm's law: I = V/R = 25/2.5 = 10 Amps. P = VI = 25*10 = 250 watt. Does this power exceed the 150W limit of the 2N2955 output transistors? No, because the transistor is either off or on. While it's turned off, the power dissipated in the transistor is 60 volts times 0 amps, which is zero watts. While it's turned on, the power dissipated is 0.2 volts times 10 amps, which is 2 watts. No problem! Using a 250W power supply would (at least theoretically) be capable of firing the coilgun continuously. Another way to think about the power supply is in terms of power, rather than volts and amps. You need 25v at 10A, but only for about 100 msec (se al value) while coils are energized. So, that's 250W times 0.1 seconds, or 25 W-seconds total. If you want to be able to fire once every 5 seconds, you need a supply capable of generating a continuous power of 5W at 25v. 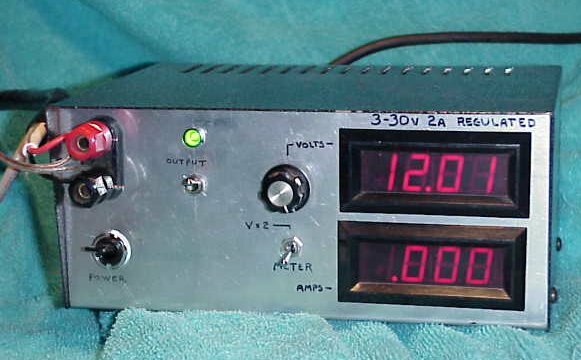 If you only want to fire once every 10 seconds, you need a continuous power of 2.5W at 25v. As you make the duty cycle lower, the "continuous power" k at this in terms of energy. Roughly, a 9v battery contains about 500mAH (milliamp-hours) at, of course, 9vdc. The total energy is therefore 9v * 0.5AH which is 4.5WH. Three 9v batteries gives you about 30v, and about 15WH. Converting "watt-hours" to "watt-seconds" means multiplying by 3600 sec/hour. So 15WH = 54000Wsec. Each time you fire, you use 25Wsec. So the maximum number of launches possible from three 9v batteries is 54000/25 or about 2160 launches. You would do this, of course, by using the batteries to charge a capacitor bank through a voltage step-up circuit or through a current-limiting device. The internal impedance of the batteries themselves is much too high to pull 10A out of them. I use a bench style adjustable regulated and metered dc power supply borrowed from a friend. The front-panel metering is great! However, the switching supply cannot provide the maximum current required for my coils. This supply can provide up to 15v at 3 amp, which is a great start. I am adding some large (20,000 mfd) external capacitors to supply the surge current. Before this bench supply, I used a good quality HO train set supply. It was fully adjustable and protected from overloads. It simply turned off when the load became too heavy. Worked great, though I had to provide my own voltmeter. But I wasn't comfortable working in its low voltage range -- it generates low voltage by chopping up a higher voltage, thinking it was trying to start a small dc train motor. After all the bugs are worked out (hah!) I'll think about building a dedicated supply that's more portable. Until then I want to remove variations in voltage and current as much as possible, so I can concentrate on the gun itself.